My fuel gauge isn't reading properly any more. It seems to show approx 4 bars less then what it should be. When I turn the key on at first it shows correctly but then drops in a approx 10 seconds. When it shows empty the low light doesn't come on which it shouldn't at that point. I still have 100 km to go before it should come on but the gauge is showing empty. You may have high resistance in the fuel tank connector or other in tank connections. 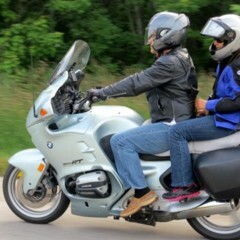 Start by having a read here: http://forums.bmwmoa.org/showthread.php?82560-R1150-R1100-Fuel-Gauge-Reading-Low-A-Fix. FWIW, I tried all the known fixes including the new ground wires solution outlined in the link and still can only get 8 bars. Its one of those things I've resigned to defeat as the time spent ripping the bike apart each time just isn't worth it to me. Also, I'm the only one seeing the problem so I just don't let it bother me. Did you clean the contacts of the multi-contact connector under the right side of the tank? I use a piece of plastic tubing of appropriate diameter with a small strip of 400 wet or dry inside and DeOxIt, then clean the male connector pins with a paper towel. For the female pins, same basic technique, but a small diameter wooden dowel, no sandpaper. I finished my annual maintenance about 6 weeks ago, and after cleaning the contacts, the distance from full tank to 1 bar down increased from about 35 miles to 40 miles. It used to work properly then this winter did major service, removed fuel tank to replace fuel filter. The first tank I didn't see a problem then the second tank I thought my fuel mileage did a major dive,till I caught on it was the gauge. This data selected from 12 fill-ups over about 450 miles. The gauge now goes to 10 bars at every fill-up. Correction: make that about 1800 miles. "Additionally, vehicle's fuel sending units equipped with silver plated resistor card/contacts are especially vulnerable to attacks by elemental sulfur and/or hydrogen sulfide found in fuels. Adding BMW Group Fuel System Cleaner Plus immediately upon noticing erratic fuel gauge behavior may, in many cases, restore proper performance due to the additive's ability to remove the harmful sulfur compounds from the sending unit's contact surface. Additionally, BMW Group Fuel System Cleaner Plus can help protect the fuel gauge from future malfunctioning by coating all metal surfaces of the fuel system." Techron/Chevron makes the BMW Cleaner. After 15 years with Darth, I've learned to ignore the RID. I simply fill the bike up after every ride and know I'm good/safe for 240 miles the next ride! I also have this problem with my 04 1150RS. I've cleaned the contacts and it does seem to help. I have seen products that claim to help improve electrical contacts. Not just cleaners but contact enhancers. Anyone have any experience with such products? When this happened to me, at about 90K, I did all the proper contact cleaning at both the tank connector and at the RID connector behind the front fairing. Helped a bit but not enough. So I took off the tank and flipped it in my hands and shook it a bit, then flipped it and shook some more. I could hear the float inside running up and down the tube. Did it a few times more.